After all the beads have been played, each player counts the number of beads in a row. You get one point for a 3 in a row. 2 points for a four in a row, and 3 points for a five in a row. The person with the most points wins. 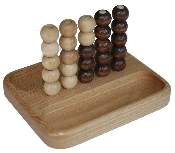 Includes game board, 26 beads and playing instructions.